Conservatives are crying into their Bibles and shaking their flag-draped fists. Libertarians are sighing at the madness, celebrating Edward Snowden's continuing victories over the most powerful espionage apparatus in the history of the world, pointing out that the gay marriage decision is good but that the State should have no say in our social institutions, arguing with each other over abortion, and quietly stockpiling bullion, bitcoins, food, and ammunition. I failed to see all of this coming. 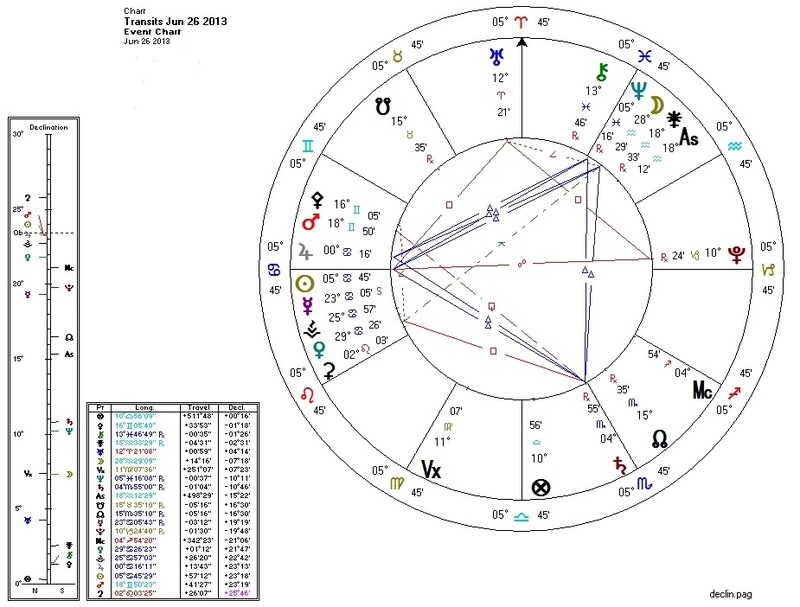 I didn't look for the Neptune/Saturn/Jupiter grand trine at month's end which would give Neptune, the lord of the Left, the power to impose his will in truly spectacular fashion. I didn't spot the Mercury contraparallel to Pluto -- which would severely weaken Pallas in Gemini (even with the support of the North Node quincunx) and allow the beast of the State more victories than defeats in the waning days of the month.